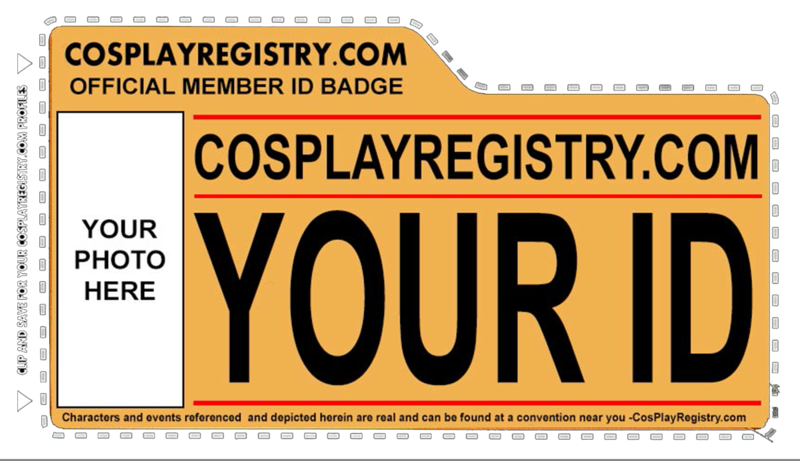 What is the Cosplay Registry? Let me introduce myself. My name is Jason and I am CPR0 , founder and creator of CosplayRegistry.com. For the past decade I’ve been the co-founder and lead photographer for Girls of the Con. We’ve striven to create equality and acceptance in the cosplay community since 2007. Over the past eleven years we’ve covered hundreds of conventions, photographed 100k+ cosplayers, published seven yearly cosplay calendars, and seen our work published in the likes of Marie Claire UK, the book “Cosplay World”, and in the illustrious pages of Cosplayzine magazine for their October 2017 issue. So what makes our registry special? We are the DMV of COSPLAYERS. Get your ID, display your ID, and get your social media profiles the attention they deserve. Think of it as a license plate for Cosplayers. Completely anonymous. Share as much or as little information as you’d like in your profile. Our unique search engine design allows us to assign your chosen CPR ID directly to your account and have it point at your custom profile. Just like the license plate on your car identifies it’s owner, the CPR ID on your profile and badge identifies you absolutely and no two are alike. Decide what type of CPR ID you want to sign up for. Create your profile, add your social media links, contact info, Bio, Pics, and More. We’ll assign you a number or name based off your service level and that ID is yours forever as long as you are a member. Number assignments take place within 24 hours of service purchase. If you’ve purchased a custom name or would like to request a specific number combo you can easily do so by replying to the welcome email you receive when starting your account. When you attend any event where your photo will be taken or video will be taken of you, display your CPR ID. We’ll send you a customized badge image (with or without photo) that you can print off and display. Or feel free to make your own design. Or pick up one in our badge store for a minimal cost. However you decide to display it make it the first photo any photographer takes of you. Make it a point to show it off during a video or photo shoot. Give them the power to find you once the con is over without the hassle of trading and or keeping up with business cards or try to stop on a crowded show floor to exchange information. One photo of your CPR ID badge gives them all they need to find exactly you in the registry and tag you effectively. No more searching private groups. No more searching social media for weeks after a con. No more “Have you seen me?” posts. Save the person capturing your image the detective work they have to go through to make sure you get credit. Your CPR ID is reusable, responsible, and permanent for the life of your membership. Saves Paper. Saves Money. Saves Time for both you and the person capturing and promoting your image and brand. Sit back and watch as your likes, follows, shares, and views skyrocket. Get the most from your hard work by sharing it with the broadest audience possible. Make it easy for photographers, videographers, potential clients, and fans to find you, tag you, share you, view you, like you, and you get tons of fresh content for all your social media endeavors. You spend hundreds of dollars, maybe thousands, on convention costs, costuming costs, etc. Why not spend a few more dollars each year to make sure you get credit? Our most expensive plan is just $1.99 a month! So what are you waiting for? This is the most useful prop you’ll ever add to your costume. Get your CPR ID today and start getting the attention you deserve. One ID that ties exclusively to your profile here. Social media services, websites, emails, all those things come and go but your CPR ID always ties to your Cosplay Registry profile. Update it as often or as little as you like so your most up to date info can always be found with a single simple ID. Breathe life back into your cosplay efforts with CPR. Get yours today! CLAIM YOUR UNIQUE CPR ID AND PROFILE TODAY!